With Invoice factoring you can get paid up to 85% up front of a customer’s invoice, for a fee of only 1% - 5%. Invoice factoring is a type of financing where you sell a customer’s outstanding invoice at a discount to profit from the capital. The institution granting the invoice factoring will give you an advance, usually worth about 70% - 85% of the value of the invoice. Then, once it’s paid off, you’ll get the rest of the value minus a fee. Invoice factoring has a lot of administrative costs and is usually used by businesses that have large contracts with the government or other businesses that offset those costs. An advantage of invoice factoring is that it there aren’t any credit requirements. Since the customer is the one responsible for repaying the invoice, it’s their credit that’s taken into account. Some institutions ask for a monthly factoring minimum. This puts you into a contract with a minimum number of invoices that they factor every month, and a fine if you can’t meet the minimum. Some institutions will also ask for a minimum size of individual invoices since the processing and administrative costs might be more than the gains of a small invoice. Having a monthly factoring minimum will usually mean your minimum for individual invoice size will be smaller. Normally, most of a loan’s costs will come from interest and a small amount of fees. The cost of invoice factoring, on the other hand, consists of a single fee, sometimes with no interest payments at all. The fee that the institution keeps for themselves as payment is called a factoring fee. This fee is usually between 1% - 5%, partly depending on the customer’s credit score. The size of the fee will also depend on whether the factor is recourse or non-recourse. A recourse factor means you’ll have to give compensation to the institution if an invoice isn’t paid on time, either by buying it back or replacing it with a new one. Since a non-recourse factor won’t have this extra protection, your factoring fee will probably be higher. Contracts with monthly invoice minimums will normally have a lower factoring fee. However, if you fail to meet the minimum, the fine will probably be more than you’d save from a having smaller fee, so the trick is to make sure you can supply the monthly minimum. Factoring fees are sometimes expressed as an APR, and if so, it will be a much higher APR than other loans. Keep in mind, however, that invoice factoring is so short-term that it may cost you less in the long run, even with such a high APR. Sometimes there are fees for invoices that aren’t paid on time. In this case, an institution can charge you in two ways. The most common way is known as discount rate. The way a discount rate works is you’ll only ever be charge a factoring fee, except that it’ll start to increase after the payment term has passed, usually at a rate of 1% per week. The other way is known as the prime plus method, which basically consists of paying interest. You’ll pay a fixed rate (usually about a 12% APR) right from the beginning until the invoice is paid. Again, while 12% is a pretty high APR, in the long run this can be cheaper than a discount rate, depending on how long it takes for the invoice to be paid off. The main difference between invoice factoring and invoice discounting is who controls the invoices. When an invoice is factored the institution takes control of it. At this point, it becomes their responsibility to collect from the customer. When an invoice is discounted, on the other hand, it’s used as collateral, and stays in your control. Some borrowers prefer invoice discounting because it lets them collect from their own customers and keep their need for outside financing discrete. Since the invoice is repaid by the customer, the credit of the borrower doesn’t come into consideration, which is an advantage if you have bad credit.  With invoice factoring, on the other hand, you pay at regular intervals, and take on the risk that the customer might fail to pay their invoice on time. Invoice factoring can be a handy form of financing under the right circumstances. If you feel it's a good option, it’s recommended you talk with an expert to best understand your own situation and determine the best way to keep your business running at its full potential.